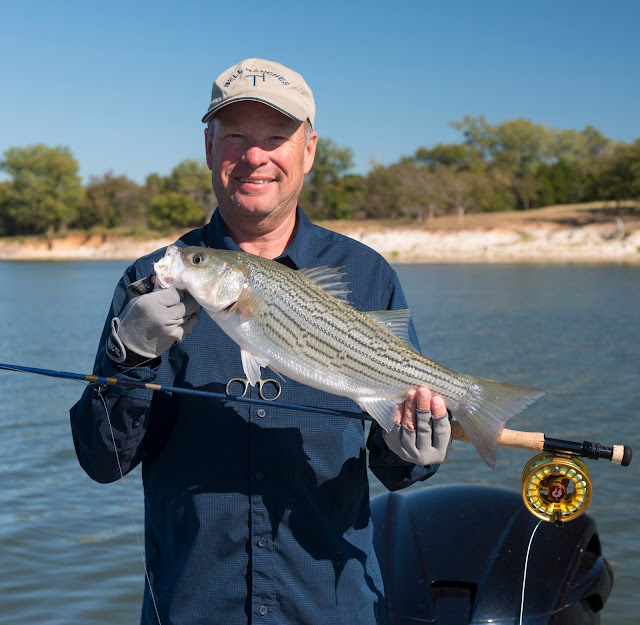 Cody wanted to me to enjoy my week's Fall Break, so he booked a Lake Texoma trip with Guide Steve Hollensed of Flywater Angling Adventures. Originally planned for Thursday, the high winds, tall white caps, and crazy weather pushed our trip back a day to Friday, which turned out to be a beautiful, clear blue sky, and almost no wind day. Those conditions meant we had to be on top of our game, because the fish could see us and our zinging fly lines long before we saw them. Choosing to fish with our 7# rods loaded with Generation 3 Class V Streamer Stripper lines, we cast to rocky shorelines and stripped our lines in quickly, then pausing briefly to let our flies sink, we resumed stripping quickly, and cast again. Our retrieves imitated the abundance of bait fish present. Our numbers of fish were not high but the quality of fish equaled personal bests on many catches. We set out on the water prior to sunrise and watched a beautiful morning dawn. Heading to where Osprey were resting in trees, I cast to a shoreline lined with big rocks. Steve told us we were going to move after this cast, so I cast towards a small tree about three feet prior to the point, and on the second strip, a fish hammered the chartreuse and white Half and Half Fly. Then, the fish leapt completely out of the water, and Steve and Cody were hollering, "Whoa, Smallmouth! Smallmouth!" and "That's a nice Smallmouth!" "C'mon, Miss Julia, bring her in." As it neared the boat, the fish headed under the boat by the motor. At one point, I thought I lost the fish because the line slacked as it swam back toward shore, but another strip eliminated the slack, and I reeled in the excess line. The leader was at my tip guide, and the fish swam alongside the boat avoiding the net. While the fight lasted a little over two minutes, when it kept swimming away from the net, I thought I wasn't going to land the largest Smallmouth I had ever caught. However, Steve netted it, and Cody helped me weigh, 2 1/2 pounds, measure, 17 1/4 inches long, and take my picture with it before releasing that beautiful fish back to its home waters. Cody began fishing after an enjoyable lunch. 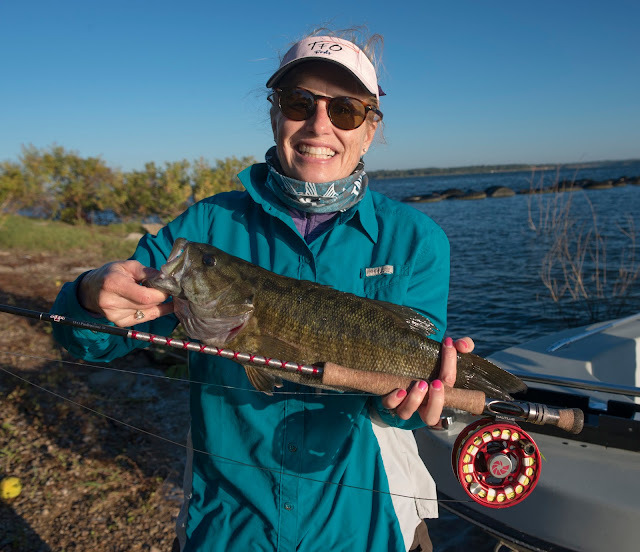 Using a fly Cody learned to tye from Jen Ripple during her September visit to the Texas IFFF Convention and the Dallas Fly Fishers meeting, Cody caught his personal best Smallmouth and Striper. We were fishing a rocky embankment, and Cody cast his fly about two inches in front of the rocks. The fly was barely in the water when his line went tight. About two feet from the boat, the fish surfaced just enough for us to see its back so we could identify it as not a Striper. A few more strips, and Cody's rod tip doubled over. Cody worked his rod tip under the boat, as the fish swam from one side to the other. Once back on the shore side of the boat, Cody stripped the fish in, and Steve netted another large Smallmouth. Cody's fish weighed 2 1/4 pounds but was 21 1/4 inches long. I really don't know why the fish was skinny, because it was healthy and fought hard. I enjoyed snapping his photo with the longest Smallmouth I had ever seen! With waters as smooth as glass, we headed back to a previously fished shoreline. Graciously, Cody let me have the front of the boat. Continuing to cast his shad-patterned fly towards the shore while an Osprey watched, Cody's line went tight about five feet from the shore. Cody reeled, and the fish pulled line off, and Cody reeled and the fish fought back. We knew Cody either had a Striper or a White Bass. When he landed the fish, I thought that it was a Hybrid, but Steve told us since these landlocked Stripers don't have a wide gene pool variance, that sometimes their stripes are broken, so looking at the their tongue confirmed the fish identity as a Striper or Hybrid. Cody's catch had a double tongue, so Cody caught a 4 1/4 pound Striper. All-in-all, the day's totals were two Smallmouths, two White Bass, one Striper, and because the bait fish were so incredibly thick, five Threadfin Shad. We also saw many Blue Heron, Osprey, including seeing one catch a fish and fly off with it, and a Bald Eagle. We worked hard for our catches, and enjoyed a most beautiful Fall day on the water!